Post-elections, Haryana has been witness to one rat-race after another. First it was the Chief Minister’s chair, then a ministerial berth followed by a scramble for portfolios which is still on. A fleet of Sonata cars purchased by the Haryana Government for its top functionaries have been allotted to its new claimants following the assembly election results propping up a new government. Haryana Chief Minister Bhupinder Singh Hooda today called on the President, Dr A.P.J. Abdul Kalam, at Rashtrapati Bhavan. 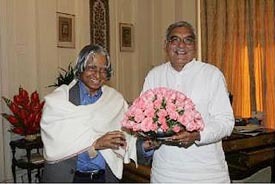 Haryana Chief Minister Bhupinder Singh Hooda greets the President, Dr A.P.J. Abdul Kalam, at Rashtrapati Bhavan in New Delhi on Monday. Stone crushers in Faridabad district have stopped working for the past about 15 days in protest against what their owners call a hike in the price of raw material, pushing up the prices of building material in the Delhi market. Thousands of people, particularly residents of five villages namely Mohammadabad, Garhi, Bindrauli, Bhowapur and Nasirpur, have been facing a serious water crisis for the past three months following the failure of officials of the Public Health Department to replace the defective electric motors installed in the waterworks. Green Circle, an organisation working for better environment, today demanded installation of solid waste management plant in Ambala. The Additional District and Sessions Judge, Mr Surender Kumar, convicted 12 persons of Bidhwan village for murder and sentenced them to life imprisonment along with Rs 1000 fine yesterday. Re-investigation has been ordered by a city court today into the disappearance of a woman and her daughter. The Haryana Governor, Dr A.R. Kidwai, has summoned the Vidhan Sabha to meet here on March 21 at 2 p.m. The Haryana Government has sent back the Administrator of HUDA, Gurgaon, Mr Prem Chand Verma, a member of the Indian Revenue Service, to his parent department with immediate effect. The Agriculture Scientists Recruitment Board will hold interview for the post of Director, National Dairy Research Institute, Karnal, on March 18 at New Delhi. Mr Nasib Singh Nagauli (75), vice-president of the Ambala district unit of the Indian National Lok Dal, died at his native village, Nagauli, in Naraingarh tehsil, today after a prolonged illness. Post-elections, Haryana has been witness to one rat-race after another. First it was the Chief Minister’s chair, then a ministerial berth followed by a scramble for portfolios which is still on. However, even as this tussle goes on, the newly-constituted Cabinet has been busy fighting another kind of battle—allotment of houses at prime locations and in elite sectors of Chandigarh. This, despite a ministerial complex of 18 houses in Sector 12 A, Panchkula, constructed during the regime of the last government which has no takers from among the ministers in the Congress Government. 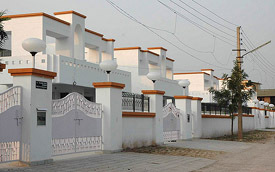 These recently constructed residences which housed five Ministers of State of the Indian National Lok Dal (INLD) and a Chief Parliamentary Secretary are going abegging, showing, thereby, that Panchkula continues to be Chandigarh’s poor cousin. All 10 ministers in the newly constituted Haryana Cabinet were finally allotted residences of their choice in the city, today. Former Union Minister, Mr Venod Sharma, has been allotted a house in Sector 3, the best among those available given its proximity to the Chief Minister’s residence. Finance Minister Mr Sampat Singh, was occupying the same house during the reign of the INLD government. Mr Birender Singh has been given a house in Sector 5 while five ministers have been sanctioned houses in Sector 7, including Mr Chander Mohan, likely to be the Deputy Chief Minister. Despite the fact that he has his own house in Panchkula, he has opted for another in the city as well. Mr Randeep Singh Surjewala has been allotted the house occupied by the Town and Country Planning minister of the INLD government, Mr Dhirpal Singh, in Sector 2. Interestingly, this is the same house that junior Surjewala’s father, Mr Shamsher Singh Surjewala, was allotted when he was the Irrigation Minister in Bhajan Lal’s government in the 90s. Two houses in Sector 18, taken on rent by the government for many years now, will be occupied by Ms Kartar Devi, the only woman in the Cabinet, and Mr Phool Chand Mullana while all the houses in Panchkula await occupants. Meanwhile, when contacted, the Officer on Special Duty (OSD) to Chief Minister, Dr KV Singh, said that the houses in Panchkula would not remain vacant for long. A fleet of Sonata cars purchased by the Haryana Government for its top functionaries have been allotted to its new claimants following the assembly election results propping up a new government. Only one Sonata car still remains at the disposal of a presiding officer who was allotted the vehicle by the Om Prakash Chautala-led government. Sources said Mr Satbir Singh Kadian, Speaker of the last Haryana Assembly, is yet to return the Sonata provided to him by the previous government. When Mr Kadian’s staff were contacted by the department concerned regarding the car, the reply reportedly given was that Mr Kadian would return the vehicle only after a new Speaker was chosen. The pro tem Speaker, Mr Raghubir Singh Kadian, could be given a Sonata car only because the Deputy Speaker of the previous assembly, Mr Gopichand Gahlot, had resigned his post to contest the assembly elections on the INLD ticket. The Sonata car returned by Mr Gahlot on his resignation is being used by the pro tem Speaker. Mr Satbir Singh Kadian, who had won the 2000 elections from Naultha on the INLD ticket, was not offered the party ticket by the INLD for the 2005 assembly elections. Mr Kadian, therefore, did not feel the necessity to resign as Speaker. While technically there may not be anything wrong in Mr Kadian using the Sonata till a new Speaker is chosen, it would have been in the fitness of things if he returned the car as soon as the Chautala-led government had resigned on February 27. It was learnt that a minister of the previous INLD government also kept his Sonata car till the last moment. All the other ministers of the INLD had returned their cars after the government resigned following the counting of votes on February 27. Mr Chautala himself did not use his official cars once he submitted his resignation as Chief Minister. But one minister refused to return his car and claimed that as a minister of the caretaker government, he was entitled to use the car. Since the Congress took a long time in deciding who would be the Chief Minister, the INLD leader, who had lost the assembly elections, got more time to use an official vehicle. He finally returned the car on March 5, the day Mr Bhupinder Singh Hooda took the oath as the Chief Minister of Haryana. Describing the visit as a “courtesy call,” the Chief Minister said the President showed deep interest in the development of Haryana and identified agriculture and industry as areas where the state had a vast potential. Mr Hooda said he would invite the President to the state for inauguration of the eigth unit of the Panipat Thermal Power Station when it was completed. The President, he said, had visited the state four times. Mr Hooda said there was no “groupism” in the party and all Congressmen had faith in the leadership of Ms Gandhi. To another question, Mr Hooda said his government would not act vindictively against its political opponents. “An inquiry will be held into the chargesheet submitted by the Congress against the previous regime and those found guilty will be punished,” he said. According to the general secretary of the Faridabad Stone Crushers Association, Mr Kamal Luthra, the price of raw material had been constantly raised during the term of the Chautala government because there is a monopoly of one company, the Sethi group of mines, in Faridabad district. He told TNS on the phone that during the Assembly elections, the price was raised from Rs 90 per tonne to Rs 103 per tonne. He also said that besides this price, another Rs 70 per tonne was also being charged. A delegation of the association met the Chief Minister, Mr Bhupinder Singh Hooda, in Delhi today in this regard. Mr Hooda reportedly assured the delegation that his government would not allow anyone to charge more than what was the legal price. When contacted, Mr Surinder Sharma, Manager of the Faridabad-Gurgaon Minerals Company, denied that the company had increased the price of raw material. He said in November, 2002, the company used to charge Rs 115 to Rs 140 per tonne, depending upon the quality and variety of raw material. In March, 2004, the company reduced the price of raw material and fixed it at Rs 100 to Rs 133 per tonne. In September last year, the price was further slashed and was fixed at Rs 100 per tonne, irrespective of the quality and variety of stone. Mr Sharma said the company reduced the prices over the two years notwithstanding the increase in the price of diesel from Rs 19.28 per litre to Rs 26.76 per litre now. He said the company consumed diesel worth about Rs 1 crore every month to run its machinery. If the diesel cost had gone up, why did the company reduce the price of stone? Mr Sharma said the company had developed the only two quarries working in Faridabad district after the Supreme Court ban of May 6, 2002, on mining in Faridabad and Gurgaon districts, at a considerable cost. Both are totally mechanised. As the company recovered part of its development cost, it was able to reduce its prices. He denied that the company was charging extra. Mr Sharma said raw material in large quantities was coming to the Delhi region from Alwar and Bharatpur districts of Rajasthan and Bhiwani, Yamunanagar and Panchkula districts of Haryana. He said the company also reduced its prices to compete with the suppliers from these places. However, now the cost of production did not allow the company to further lower its prices. Sources in the trade say that despite the high cost of transportation from far-flung places, the stone suppliers of these places are able to compete in the Delhi market because they overload their trucks three or four times the sanctioned capacity. Mr Luthra also agreed. The overloading is not only damaging the roads, but also resulting in the evasion of state taxes. According to a report, the residents of these villages have to fetch drinking water from distant places to meet their requirements. They warned that if the authorities failed to take action in the matter, they would be compelled to gherao officials and the waterworks in the village. In a memorandum addressed to Ambala Cantonment MLA, Mr D.K. Bansal, members of Green Circle have stated that this project is pending for the past five years with the Deputy Commissioner for implementation. Green Circle has sought that all colonies and wards should be provided with free toilet facilities. The garbage-free town scheme should be started by introducing house-to-house collection of the garbage and there should be a total ban on sale of poly bags. “Indira Park should be declared as green lung and a proper area should be identified for the rehri market,” the memorandum states. The members of Green Circle have also demanded that Gurguria Nullah should be widened and cleaned before the onset of rainy season, a bundh should be constructed around Ambala to prevent flood and all parks of Ambala Cantonment should be well maintained. It has been suggested that municipal committee should auction the area under the flyover opposite railway station for shops and beautification should be carried out. According to the prosecution, Pawan, Mange Ram, Kulbir, Kuldeep, Mahender, Pawan, Suresh, Om Prakash, Dilawar, and Virbhan of Bidhwan village and Duli Chand of Sihani, Sombir of Sirsi and Dalip of Talwandi Badshahpur village made a bid to encroach upon panchayati land in Bidhwan village on October 31, 2001. During this attempt, Kulbir was armed with a gun that was licensed for Hardan. These persons armed with lathis had an altercation with Yashvir, Lila Ram, Mahavir, Badamo, Sandeep, Dilbag and Ashok Kumar who were already present at the site October 31, 2001. Later, a scuffle ensued and Moti Lal sustained a bullet injury. He succumbed to his injury soon after. The police registered a case of murder against the accused. The court convicted Pawan, Kulbir and Hargyan under Arms Act. Hargyan was sentenced to three years while Pawan and Kulbir were sentenced to one year’s imprisonment. The woman, Jeevan Lata, and her college-going daughter, Nikita, had disappeared in January 2004 while they were on their way to Samana in Punjab. Jeevan Lata’s son, Tarun, who had accompanied them had told the police that his mother and his sister had jumped into the Bhakra canal. Their bodies were never found. Jeevan Lata’s husband, Mr Ashok, was away on a tour when the incident took place. On his return, Mr Ashok had alleged that a Ambala city resident, Mr Pradeep, was responsible for the disappearance of his wife and daughter. Mr Ashok had claimed that his son was not well and the family was facing financial problems. It was then that Mr Pradeep had extended support to the family. He alleged that Mr Pradeep had ulterior motive and he had blackmailed his wife. He alleged that his wife and daughter had committed suicide out of shame. The police had filed its report contending that the disappearance incident had taken place in Samana, Punjab, which was out of the jurisdiction of the Ambala police. Mr Ashok had filed objections to the police report in the court following which re-investigation was ordered. A notification to this effect was issued by the Secretary of the Vidhan Sabha Secretariat, Mr Sumit Kumar, today. The Agriculture Scientists Recruitment Board (ASRB) will hold interview for the post of Director, National Dairy Research Institute (NDRI), Karnal, on March 18 at New Delhi. The post has been lying vacant for the past four months after the selection of Dr Nagendra Sharma, Director of the institute, as the Vice-Chancellor of Sher-e-Kashmir University of Animal and Veterinary Sciences, Jammu. Six internal candidates of the NDRI have been called for the interview. They are Dr Rajvir Singh, Dr Ram Chand, Dr S.P. Agarwala, Dr B.K. Joshi, Dr G.R. Patil and Dr M.K. Rao. Mr Nasib Singh Nagauli (75), vice-president of the Ambala district unit of the Indian National Lok Dal (INLD), died at his native village, Nagauli, in Naraingarh tehsil, today after a prolonged illness. He was also a member of the Naraingarh Market Committee. He is survived by his wife, three sons and a daughter. His eldest son, Mr Mohinder Singh, is the Chairman of the Ambala Central Cooperative Bank, while another son, Mr Karamvir Singh, is a Marketing Executive in the Circulation Department of The Tribune group of newspapers. The Haryana Urdu Akademi will organise a seminar and a mushaira on the theme of “Sahir Ludhianvi ki shaksiyat aur fun” here on March 18. While stating this here today, the Secretary of the akademi, Mr Kashmiri Lal Zakir, said the Haryana Governor, Dr A.R. Kidwai, would inaugurate the mushaira and Prof Mohammed Hassan would preside over it. The Haryana Government today removed Chairmen of 22 Improvement Trusts in the state. They were appointed by the Chautala government. The state government has decided to appoint administrators of the trusts.